Thanks to everyone who joined us this month! We had 19 participants from seven countries, and we cooked with our homegrown thyme, onions, garlic, chickens, asparagus, parsley, basil, chives, arugula, mint, Swiss chard, ransoms, tomatoes, pandan, oregano, rosemary, strawberries, cilantro, black-eyed peas, and lemon balm. Grow Your Own #11 has begun! If you are new to Grow Your Own, visit the Grow Your Own page to learn more about the event. Deadline for entries is the 28th of every month and I post a round-up a few days later, on or around the 1st of each month. Denise of Chez Us (California, United States) sauteed fresh sweet English peas with some beautiful French thyme from her garden and made a simple and tasty dish. Lenny missed out, but I’m sure he can coax her to make them again! 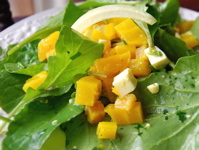 Using the fresh arugula and chives from her garden, Victoria of Feed Yourself (Washington, United States) made a beautiful salad with golden beets, onion, and feta. Don’t you love the color? 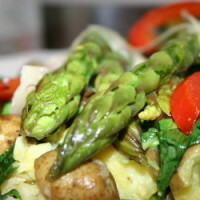 In Ohio (United States), Denise of Time to Cook created an Asparagus-Mint Frittata (no photo available) using the fresh asparagus, parsley, and mint from her garden and free-range eggs from her neighbors. How can I get some neighbors like that? Hmmm. Jessica of Finny Knits (California, United States) made a tasty pasta with sausage and chard cooked up with her homegrown tomatoes that she canned herself! Quite the frontier woman! I keep hoping I’ll stumble over a treasure trove of wild garlic (ransoms) like Inge of Vanielje Kitchen (Somerset, England), but it hasn’t happened yet. 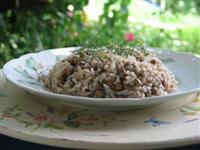 She turned her find into a lovely salad with bashed tomatoes and fresh asparagus, as well as several other dishes. When Mother Nature took her toll on the tomatoes, Deborah of Austin Agrodolce (Texas, United States) turned the little green gems into pickles! 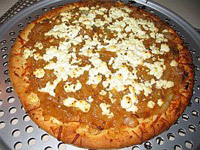 Her recipe is quick and easy, always a winner in my book. Ning of Heart and Hearth (Manila, Philippines) whipped up a meal in a jiffy for her family. 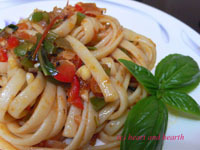 She made a simple pasta dish with anchovies, salsa, fresh vegetables, and basil from her balcony garden. 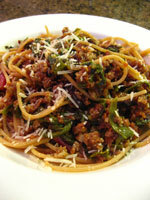 Now that’s a quick and tasty meal for a weeknight dinner. 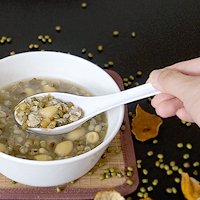 I always learn something new when I read the Grow Your Own posts, which I think is part of the fun, and this time I learned that bean soup can be dessert! Wiffy of Noob Cook (Singapore) made an elegant green been soup with mung beans, gingko, sago, and her homegrown pandan leaves. Gay of A Scientist in the Kitchen (Philippines) felt inspired by Adam and Pim and used one of the chickens they raise themselves to make a five-spice chicken with lemongrass and and crushed pepper. Simple and gorgeous! It’s still cool in Ontario, Canada where Natashya of Living in the Kitchen with Puppies is growing her garden. Though peppers and other garden treats are still a few months off, she can still harvest her herbs, so she made a big herb focaccia onions using her homegrown oregano, thyme, chives and rosemary. 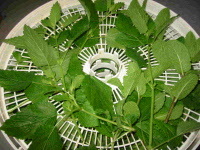 Drying herbs is a great way to preserve them, and Hannah of The Purloined Letter (Maryland, United States) dried her homegrown lemon balm, spearmint, and peppermint in a dehydrator, then stored them in a jar as an herb mix for winter tea. She’s also growing her own stevia, a great plant for sweetening tea. 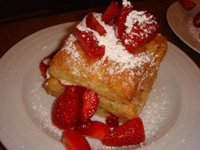 Erica of Gopher Meets Bruin (California, United States) made a delicious strawberry shortcake using her homegrown strawberries as well as raspberry preserves homegrown by her father-in-law, puff pastry, and cream. Kim of Live Love Laugh Eat (Virginia, United States) was lucky enough to see Bobby Flay do a cooking demonstration back in March and got an autographed copy of one of his books! 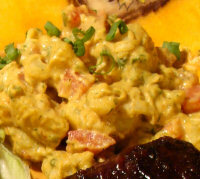 She made a Southwest potato salad from it using her homegrown green onions, red onions, and cilantro. AS of Life’s Too Short for Mediocre Chocolate (California, United States) made these snappy lemon ginger cookies that look delicious, and she even made an extra batch for someone who was feeling under the weather. Now that’s a good friend for you! When she visits the family farm, Cris of From Our Home to Yours (Brazil) always receives a gift of homegrown black eyed peas from one of the women who works there. Cris learned how to make a northern Brazil dish called baiao-de-dois, which has rice, chorizo, cilantro, and of course the peas! Todd and Diane of White on Rice Couple (California, United States) took us on a tour of their beautiful edible garden and shared a tasty BBQ pork loin stuffed with Swiss chard from their garden. A tasty end to a fun post! 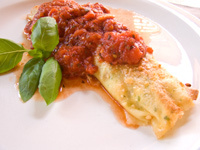 I (Virginia/DC Metro, United States) put our indoor basil and parsley to good use in some herb crepes which we served with a ricotta spinach filling and a spicy homemade pasta sauce. Thanks for posting the round up! I was wondering about how you go about growing basil indoor. I would like to try it. Thanks everyone! I love doing the round-up every month, there’s always so much variety! Ina, that’s a full post in itself, but here’s the quick version: buy basil seeds, buy a loose potting soil and some peat moss, mix it up and pour into a seeding tray, scatter the seeds around and just barely cover with more soil. Set under a grow light (promotes faster germination and growing). Once the seedlings are a 2 inches tall transfer to a larger growing space, perhaps disposable cups or peat containers. Once they’ve gotten 3 or 4 inches tall you can transplant them to a small pot, about 8 inches. Grow near a window that faces south or west because basil likes lots of sun. Keep them watered. Like I said, that’s the short method, but I’ll try to post about it in more detail sometime. Hopefully I will be able to join in next month. Just starting to get warm weather and sunshine around here! YAY! 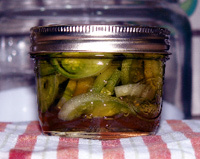 A green tomato pickle recipe! I will be making these at the end of the season for sure.